Holland U21 international Artz moved abroad in 2006. He signed a 3-year contract at Cercle Brugge. In his first two seasons he suffered from bad injuries and played just one competition match. Also his performances in his third season were not enough to extend his contract when expired in June 2009. 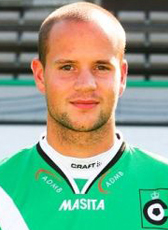 Artz signed after s successful trial a 1-year contract at FC Volendam in July 2009. His contract was not extended at the end of the season. On a free transfer Artz rejoined the Belgian league with signing a 2-year contract at FCV Dender EH in August 2010. At the expiration of his contract at the end of May 2012, he has left the club searching for new opportunities. Artz is playing for the Belgian amateurs of KVK Ieper in the 2012-13 season.